When you have myopia, one of the cures would be wearing nearsighted glasses. 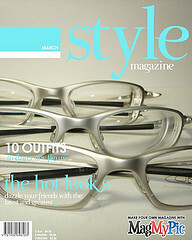 These days, glasses are not just a tool to help people see clearly but are also a fashion statement. When choosing nearsighted glasses, there are several things that you should take into consideration. For a round face, choose symmetric frames without odd angles, with lines in the same proportion in length and width. Choose bridge that is either clear or lightly colored, to give the illusion of wider eyes. For an oval face, choose eyeglasses frames that are walnut-shaped. This will enhance the look of the face. There are some people with oblong face that is longer in proportion than it is wide. Look for frames with the same depth from top to bottom. For a square face with very pronounced jaw line and wider forehead, try looking for frames that are narrower or wider than they are deep so that the face will appear less wide. Thinner shaped and oval lenses could also balance out this face type. A diamond-shaped face is great with just about any frame style. Nevertheless, rimless frames and cat-eye frames compliment a diamond-shape face nicely. The frame color is also important since it could accentuate one’s natural features.